Rapper Lil Wayne performs onstage during the 2011 MTV Video Music Awards at Nokia Theatre L.A. LIVE on August 28, 2011 in Los Angeles, California. Lil Wayne added a bold color to his MTV VMA ensemble with a pair of red and yellow sneakers. Each show had a different lace color. 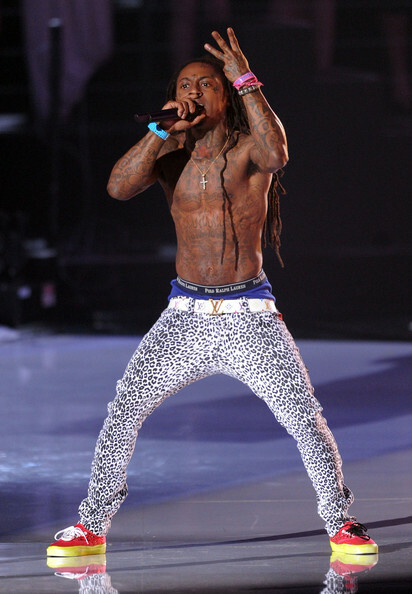 Lil Wayne wore a white Louis Vuitton belt with his leopard print jeggings for the MTV Video Music Awards.